Kluban Bothok is one of traditional food of Pekalongan regency, Central Java, Indonesia. 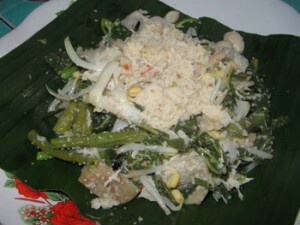 Kluban Bothok is made from cooked string bean, bean sprout, lembayung, and then mixed with special spices of urap. Kluban Bothok is usually served on a plate before bothok soup (a soup consists of tofu, tempeh, and grated young coconut) is finally poured on to the plate. 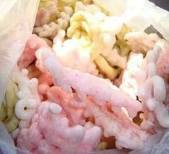 As a complement, sambal, noodle or krupuk usek (chip) can also be added.